Torpedo Bay Cafe enjoys a waterfront location in Devonport with beautiful views of Auckland harbour. The cafe overlooks a small beach and is a short walk to North Head Scenic Reserve. As part of Torpedo Bay Navy Museum, visitors can combine a coffee with a visit to the free to enter museum that showcases New Zealand's navy history. For breakfast, the menu includes eggs benedict, a choice of bagels, french toast, the 'big breakfast' and smoked salmon and scrabbled eggs. Freshly made scones are a delicious treat to enjoy with a coffee and served throughout the day. The lunch menu features the 'soup of the day, crab cake, fish and chips, lamb shank, prawn curry, a seafood selection and more. 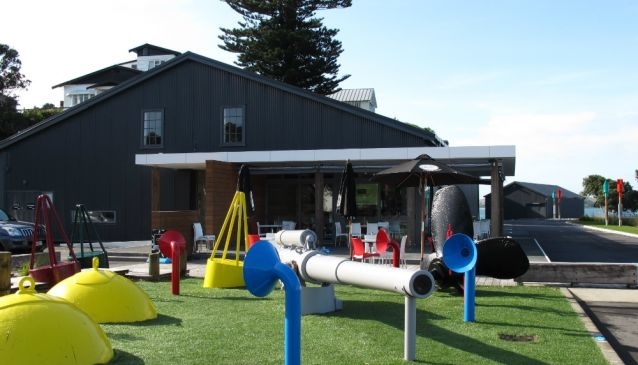 Torpedo Bay Cafe is a particular favorite with young families who can enjoy the outooor seating area and small playground area. Whatever your taste, you'll find it prepared fresh every day at Torpedo Bay Café. The cafe is closed on Good Friday, Christmas Day and Boxing Day.